Aloo saag is so popular with everyone who loves indian food. This combination of potatoes with spinach is really amazing, healthy and a favorite with many, not to mention spinach lovers. There are so many ways to make this dish, and today i bring you my version which I feel is restaurant style. It comes with a 2 part video tutorial making it much easier to follow. This recipe can be made with paneer, chicken, vegetables, mushrooms, soya nuggets etc etc. The spinach puree can be made in bulk and frozen. This is a very useful recipe and I hope you all enjoy it. Put the spinach , and the onion, ginger and garlic with green chillies in a pot and on medium heat till the spinach is cooked and the mixture is mushy. Cool it and blend it in the blender, i used my magic bullet. Heat the butter and oil and then add the chopped garlic and toss it till it starts changing color. Then add the ginger and toss it for a bit more. Add the crushed tomatoes and cook till the tomates are done. Add the spices, the potatoes , the spinach puree and the water and cook till the potatoes are done. This goes best with rotis and naans. This entry was posted in Everything Vegetarian, Fusion, Gluten Free, Ideas for meals, Indian Restaurant Dishes, Magic Bullet, Recipes with videos, Vegan and tagged . 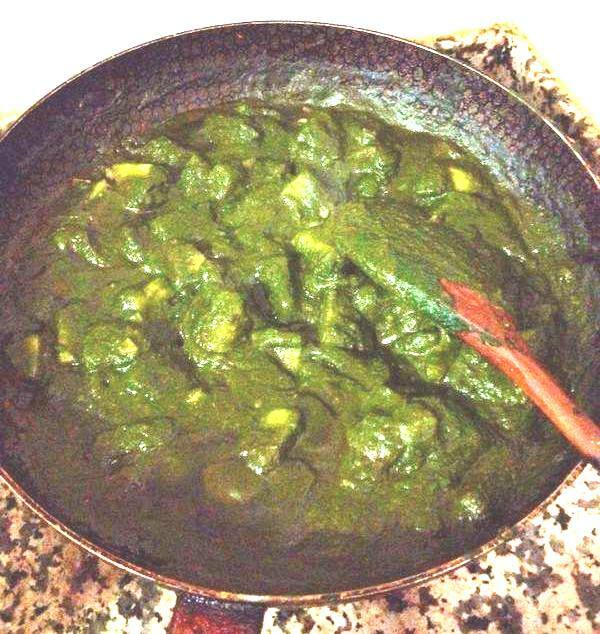 aloosaag, potatoes, spinach, vegetarian. Bookmark the permalink.